When I sail on Holland America, I always look forward to a dinner in the Pinnacle Grill. In my experience, this specialty restaurant has consistently had high quality food and superior service. The Pinnacle Grill on Oosterdam is no exception. The room is located midships on the port side of the ship. There is a section overlooking the atrium and sections that run along the windows. Although it has usually been dark outside when I have eaten at the various Pinnacle Grills, the sections along the windows always seem to be the ones that are occupied. Lighting is kept low, giving the room a more intimate, romantic look. The room also has its own tableware that helps make the visit feel more special. Although there are a variety of choices on the current menu including lamb and various seafood items, my selections went classic steakhouse items. This is where the Pinnacle Grill began and it remains a strong suit. To begin, I had the crab cakes, which were crispy without being overcooked and sufficiently spicy to give it personality. Next was the lobster bisque. This arrives as a nearly empty bowl with a small portion of lobster meat in the center. The dark brown soup is then poured over the meat. My waitress then added a spoonful of cognac and made a design on the surface using crème frische. Thick and very tasty. The 10 ounce filet mignon was cooked exactly as ordered. High quality beef with native flavor, it was nonetheless highlighted by the sauces. In this case, I selected the greenpepper sauce and the sun dried tomato sauce. For dessert, I had the Non-traditional Baked Alaska. It is an individual size Baked Alaska. The reason it is labeled “non-traditional” appears to be because it is made with Ben & Jerry's ice cream. In any event, it was excellent. On past Holland America cruises, the Pinnacle Grill has become a seagoing outpost of New York's Le Cirque restaurant. The menu and the recipes were imported from the famous Manhattan venue and the decoration changed to give the room a look reminiscent of Le Cirque. It has always been a nice evening and the quality of the meals was always excellent. Holland America is in the process of phasing out the Le Cirque nights. Yes, it was a nice feature but after you have done it several times, it did become somewhat repetitious. Inasmuch as Holland America has a high percentage of repeat passengers, I could see why they felt it was time to move on. In place of Le Cirque night, Oosterdam offered Rudi's Sel de Mer. This is a concept developed by corporate exective chef Rudi Soldoman based upon French Mediterranean cooking. 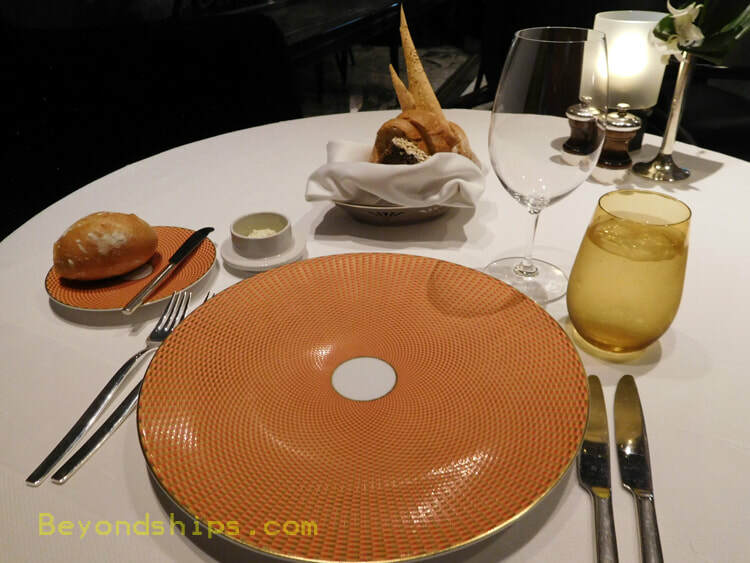 Once again, special tableware marks the change in menu but there is no change in the room's decoration. This menu focuses on seafood. However, there are also other choiaces including lamb, beef and chicken. This meal began with an amuse bouche made of scallops and seaweed. These pre-appetizer gifts from the chef have become commonplace in cruise ship specialty restaurants and for the most part are less than memorable. However, this one was quite good with a variety of contrasting tastes. For the soup course, I had the Marsailles Boulabase. Somewhat disconcertingly, it arrives at the table in the plastic bag in which it was cooked. The bag is then cut ceremonically. Despite this unorthadox entry, the dish was quite good. The waiter described it as being spicey but I did not find it so. It had just enough spice to give it personality without being overwhelming. I also had the fois gras as an appetizer. This was creamy and contrasted well with the various fruits that accompanied it. For the main course, I had the broiled lobster. This turned out not to be a whole lobster including the claws but rather two lobster tails served with butter. Quite flavorful but nothing unusual. The dessert was Rudi's souffle. I quite like souffles and was looking forward to this one. It turned out to be one of the largest souffles I have ever encountered. However, when I asked the waiter about the sauce, he replied that there was no sauce. Without sauce, a souffle is just a dry cake. This one was light and fluffy with a hint of lemon but it still was a dry cake. Even the addition of ice cream did not save it. Thus, a disappointing end to an otherwise marvelous meal. ​Each of the Vista class ships were originally built with one specialty restaurant. However, since they were constructed, cruising has changed so that many passengers expect a ship to have more than one specialty venue. To address this question, Holland America turned a section of the seating in the buffet restaurants on the Vistas into Canaletto's, an Italian specialty restaurant. It has taken some time for these restaurants to find their niche. While most people like Italian cuisine, the fact remained that you were still dining in the ship's cafeteria. In addition, it did not seem like the line was serious about these venues. Indonesian and Filipino staff would be dressed in stripes shirts and would laughingly greet guests with a few Italian phrases in a bad caricature of Italian waiters. It was meant to be lighthearted but a restaurant does not function correctly when the staff take it as a joke. To top this off, the food was just not very good. On Oosterdam, this has changed. The staff wear their normal uniforms and are serious about their work. Most importantly, the food is now up to specialty restaurant standards. As a result, we were pleased with the dining experience at Canaletto's. Considering that Holland America is a premium cruise line, it may be surprising that it has one of the best hambruger restaurants at sea. The Dive-In, located by the main pool, offers a variety of premium burgers and hot dogs. You tell the staff what you want and they give you a pager that summons you when your order is ready. Thus, you are getting something that is freshly prepared. While you wait the 10 minutes or so for your burger, there is a salsa bar where you can make tacos or enjoy guacomaloe with chips. For dessert, venture up to the Explorations Cafe on the next deck and have one of the excellent (and complimentary) chocolate chip cookies or one of the pastries. They also have specialty coffees for an extra charge. The main dining room on Oosterdam is the Vista Restaurant. It is open for breakfast, lunch (sea days), afternoon tea and dinner. For dinner, guests have a choice of traditional fixed seating dining or a flexible dining system. All other meals are open seating. The service in the main dining room was unfailingly good. It was always friendly. Thought has clearly gone into the breakfast menu. You can have the standard eggs and cereals. However, there are also interesting alternatives such as Banana Bread French Toast, Crab Benedict, Swedish Pancakes (crepes) and the Vegetable Scramble, a combination of eggs, vegetables, rice and salsa chips. The lunch menu had fewer choices and no exotic items. However, one alternative was always a burger prepared in interesting ways (e.g. with brie cheese). Afternoon tea featured a selection of large open-face sandwiches which were quite tasty. The scones were plentiful but not particularly memorable. The dinners had good variety. But the food tended to be somewhat bland. The last formal night, however, was excellent with numerous servings of lobster tails.